Rancher Roger Nicholson of Fort Klamath, Ore., looks out at the Wood River on a rainy afternoon in Oregon’s Upper Klamath Basin. He says a finalized agreement with the Klamath Tribes would prevent years of litigation over water. Many ranchers in Oregon's Upper Klamath Basin appear to grudgingly accept a water-sharing agreement with the Klamath Tribes that has resulted from months of talks. If the deal is approved by most ranchers and tribal members, it will be part of authorizing legislation in Congress. FORT KLAMATH, Ore. ­— Many ranchers in Oregon’s Upper Klamath Basin appear to grudgingly accept a water-sharing settlement between irrigators and the Klamath Tribes that was finalized earlier this month. Rancher Roger Nicholson, a harsh critic of water calls by the tribes and federal government that led to a shutoff of Upper Basin irrigation pumps last summer, says the deal is the best that ranchers could hope for and predicts it will be agreed to by a vast majority of affected landowners. The talks came after a court last year granted the tribes senior water rights in the Sycan, Wood and Williamson river watersheds draining into Upper Klamath Lake, where the tribes say a decline in sucker fish populations has threatened their livelihoods and traditions. The pact that the parties have been ironing out since late December includes various restoration projects, stipulated in-stream flows and the permanent retirement of 30,000 acre-feet of water for restoring fisheries. Nicholson said landowners won a key concession in that they’ll be compensated for land they can’t use as a result of the deal. 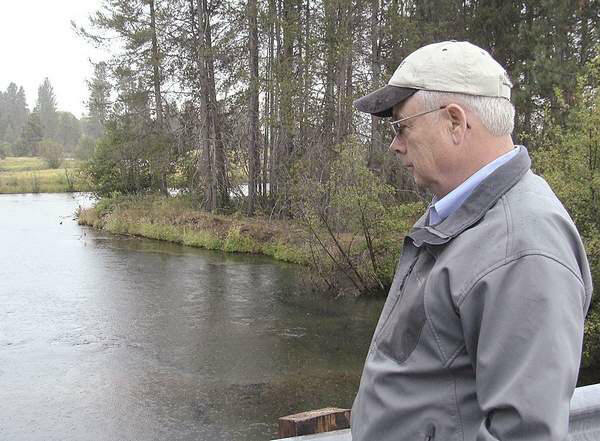 If approved by ranchers and tribal members, the pact will be included in legislation by U.S. Sen. Ron Wyden, D-Ore., to authorize and fund the Klamath Basin Restoration Agreement and a companion measure to remove four dams from the Klamath River. To be certain, opposition to the Upper Basin agreement persists. Jerry Jones, who operates a small ranch south of Chiloquin, Ore., believes the agreement could spark new legal battles. “It does away with our private property rights,” he said. Bruce Topham, a rancher in the Sprague River Valley, said he’s unsure whether he’ll sign the agreement. He objects to the amount of land that ranchers would have to put in easements – 130 feet on each side of a river or stream, he said. But rancher Becky Hyde, a vocal KBRA supporter who was involved in the Upper Basin negotiations, said most landowners realize that “everyone needs to bring their log to the fire so we can make this thing work,” and that more participation means more water. “We know what the alternative to settlement looked like because we lived through it last year,” Hyde said. “I think we have more momentum toward a settlement than we’ve ever had. Nicholson believes this is the landowners’ last chance to achieve a settlement over water.